Traveling through the streets of Gettysburg, Washington, DC, and Antietam and walking many battlefields helped me immensely with description in my historical novel, The Chrysalis: An American Family Endures The Civil War. I just finished reading Justice Sonia Sotomayr’s memoir, My Beloved World. When she was a young girl of about eight years old, she faithfully watched the weekly television program, Perry Mason and decided she wanted to be a lawyer! And then she diligently pursued that direction in every single aspect of her educational life all the way to her seat on the United States Supreme Court. 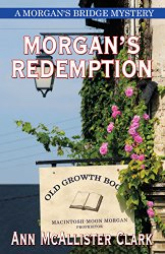 I used her early years for inspiration in my Morgan’s Redemption book.